What to buy that is Montessori Friendly at Ikea? In my Facebook group, there is not a week without a post about Montessori friendly items at Ikea. Ikea is sure family friendly. It is also budget friendly and most of the furniture is made of natural material and often of untreated wood. Their design is very child’s friendly and I feel that they have a Montessori teacher in their design team! It would surely be my dream job if I was not a Montessori teacher. From the child’s furniture to the baskets and trays and all the child’s size tools for practical life, Ikea is the favourite place to shop for your Montessori house. So follow me to Ikea and watch what I have picked for you. Also, download The Ultimate Ikea Shopping List for your Montessori needs by subscribing with the link below. You will need a child’s table for snack time, to use it as a weaning table or for crafts. We like the Flisat table with two Trofast trays to store Legos and play dough accessories. Many families have hacked this table into a light table. I don’t use the assorted stool as I prefer my children to have a chair with a backrest. You may want to use a proper toy’s storage. I love the Trofast and especially with the shelves instead of the drawers. If like me, your children have many soft toys, this hanging storage is ideal. We have hung ours over the wardrobe door with an over the door hook. I like their cotton placemat in a light colour. You can draw with a sharpie the shape of the plates, glass and cutlery to help your child to set up the table. These snap glasses are the perfect size for a weaning glass, only 5cl! The children tea set can be used for real food! Small wooden bowls for real food but also for transferring and pouring activities. A hand whisk, it’s great fun for a child to use this one and requires some effort. So it will be perfect for the maximum effort period! The colander in this toy’s set is the perfect size for little hands. And of course, it can be used to wash real fruits and vegetables! Jug. This one is in fact a vase but it’s the perfect size for pouring activities. So many choices in term of baskets! The Kura bed can be used for a floor bed too https://bit.ly/2zYojb2. Leave the mattress within the frame on the floor to have an protection on all sides. Black board map stickers – How amazing! 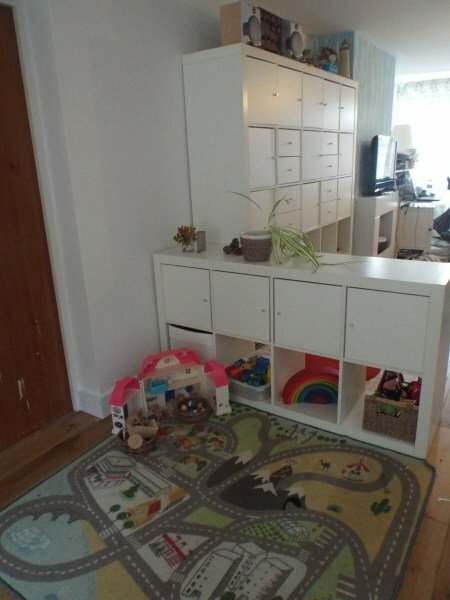 Ikea play kitchen. Make it into a real useable kitchen area for your child. A swing in your house! Montessori Parenting - are your ready for the teenage years?